According to St. Symeon the New Theologian, “What we have to say about the judgement is difficult to explain because it is not about present and visible things but about future and invisible ones”. The present things are seen, the future is invisible, and that is why purity of nous, much prayer and much zeal are required. In Holy Scripture a great deal is said about the coming judgement, which is a starting-point for eternal life and eternal Hell. Christ’s parables about the Ten Virgins, the tares and the weddings are well known. It is not easy or possible for us to analyze all these elements. However, we shall set down the most significant ones. Christ assured the people that He Himself would judge the people in the age to come. “For the Father judges no one, but has committed all judgement to the Son” (Jn. 5:22). And this is not independent of the fact that Christ is the prototype of man, since man is an image of Christ, but also the rebirth of man comes through Christ. He became man, suffered, was crucified, rose again and was taken up. He, then, will be the judge of men. “And He commanded us to preach to the people and to testify that it is He who was ordained by God to be Judge of the living and the dead” (Acts 10:42). Also the Apostle Paul preached the same teaching on Mars Hill, when he said: “He has appointed a day on which He will judge the world in righteousness by the man whom He has ordained. He has given assurance of this to all, by raising Him from the dead” (Acts 17:31). In these apostolic passages it appears that Christ will be the judge of men. A parallel passage from the Apostle Paul is his exhortation to his disciple Timothy: “I charge you therefore before God and the Lord Jesus Christ, who will judge the living and the dead at His epiphany and His kingdom…” (2 Tim. 4:1). The Second Coming of Christ is called epiphany and kingdom, which is connected with the judgement of the dead and living, that is to say, those who have died previously and those who will be living at that time. The connection of the Second Coming of Christ with the throne shows both the majesty of God and Christ’s authority to judge men, but also men’s fear in the face of the judgement and the judge. Christ used this image when he said that when he comes with the angels, “He will sit on the throne of His glory” (Matt. 25:31). The throne, which is a symbol of His glory, but also of the authority which He has over men, has its origin in the worship of the divinities of ancient times and of the god–emperor of the Romans, but also in the Old Testament, as well as in the Revelation of John. The Prophet-King David already writes in one of his psalms: “He has prepared His throne for judgement. He shall judge the world in righteousness” (Psalm 9:7-8). And there is a portrayal saying “preparation of the throne”, which has been connected with Golgotha. 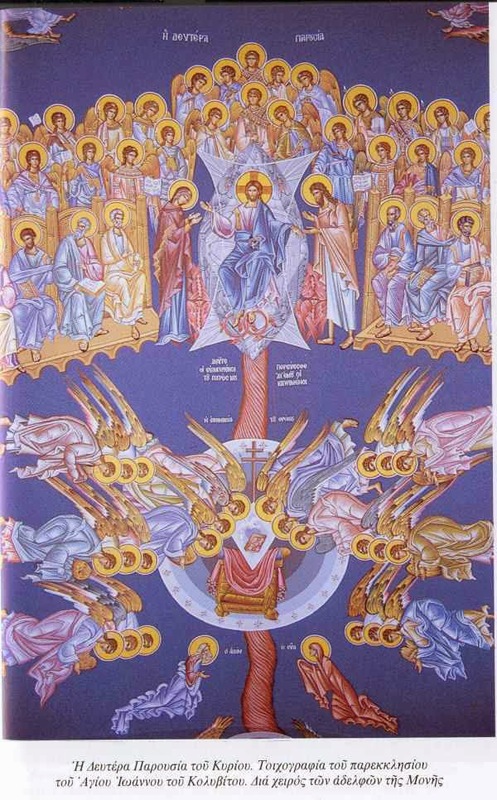 Since the eleventh century the depiction of the “preparation of the throne” has been connected with the Second Coming of Christ and the coming tribunal. The meaning of the throne, which suggests the imperial throne and the tribunal, has been closely linked with Christ’s judgement of the living and the dead, and we find it in many passages in the epistles of the Apostle Paul. Referring to the fact that we are all suppliants, servants of Christ, and we should not judge others, he affirms: “For we shall all stand before the judgement seat of Christ” (Rom. 14:10). The Christians of Rome, to whom this is said, had knowledge and experience of what the emperor’s and the judge’s throne meant. He also says the same thing to the Christians of Corinth: “For we must all appear before the judgement seat of Christ, that each one may receive the things done in the body, according to what he has done, whether good or bad” (2 Cor. 5:10). Since the final judgement of men will take place, and since the real Judge is Christ, Christians should avoid judging their fellow men, their brothers. The Apostle Paul writes: “He who judges me is the Lord… who will both bring to light the hidden things of darkness and reveal the counsels of the heart” (1 Cor. 4:5). In this passage, apart from the fact that it says that Christ is the true judge of men, at the same time the way in which He will judge is also presented. He who is the true light, by His appearing will reveal all the hidden things of darkness and will manifest all the wishes and desires which there are in the heart. In another place the Apostle Paul refers to the judgement which will come from the saints. He writes: “Do you not know that the saints will judge the world?” (1 Cor. 6:2). This passage shows again the way in which the Judgement will take place. It is not a matter of a worldly tribunal where the accusation will be pronounced, and there will be witnesses for the accusation and for the defense, and then the decision will be heard. The image of the future tribunal is taken from the judiciary, but its content is different. The appearing of the Sun of Righteousness will reveal everything, all will be stripped of their outward distinctions and there will be a comparison of saints with sinners. This is the meaning of the saying that the saints will judge the world. We shall look at all these things in what follows when we speak of how the Fathers interpret the scriptural passages which refer to the future judgement. Christ’s parable of the wedding is well known. When the king came to the place where those invited to his son’s wedding were gathered, he saw one person who was not wearing a wedding garment. Then he reprimanded him, saying, “Friend, how did you come in here without a wedding garment?” He commanded that he be bound hand and foot and cast into the outer fire, where there will be “weeping and gnashing of teeth” (Matt. 22:1-14). According to the interpretation of this parable by St. Gregory Palamas, the wedding refers to the Second Coming of Christ and to the Kingdom of Heaven. The entry of the King, who is God, is “the manifestation at the time of the future judgement”. The garment of the spiritual wedding, which was indispensable for those invited, was virtue. And naturally when the Holy Fathers speak of virtue, they mean the fruits of the Holy Spirit, and not a superficial human virtue. He who lacks the garment of virtues will not only be unworthy of the Kingdom of God, but also will be punished. Not only the soul but also the body will prove to be unworthy of that bridal chamber, if it has not lived in self-control, purity and sobriety. The punishment for not having a wedding garment is connected with his removal from the dwelling-place of those rejoicing and from close association with them. It is basically a question of separation from God and not sharing in His grace. The fact that his hands and feet are bound, by order of the King, refers to a person’s constriction by successions of sins which occur in this life. The unbearable pain and great suffering which the person feels when he commits them in this life will continue in the next life as well. The fact that he is cast into the outer fire indicates “his having become far from God because he did not do deeds of light here”. Inasmuch as he did not practice deeds of light in this life, in that day he cannot participate in the light. Saying that he is separated from God means this. The darkness into which he will be taken is synonymous with the inextinguishable fire, the unsleeping worms, the weeping and gnashing of teeth. All these things point to “the impending unbearable sufferings touching both soul and body” and the mournful cries of useless and perpetual regret. That is to say, they will repent of the deeds they have done, but it will never be possible to be comforted, for the repentance to be brought to an end. First, by the fact that they are called sheep. By this term he shows that they are righteous, gentle, forbearing, and walk the level and trodden path of the virtues, that is to say, they have followed Christ, who is the real Shepherd of men. And not only have they followed him but they have become like Him, who is the lamb of God. This means that throughout their lives they kept the commandments of God, but also that they were always ready “for the death beyond the good”. Some of them are sons of God because they are guardians “of the mystical rebirth from God” and others are paid workers, for they have acquired grace once more by the sweat of repentance and humility. Thirdly, the righteous are also characterized by humility. For although Christ reminds them of what they have done, they do not feel it. Humility is connected with love. The righteous feel unworthy of praise. Therefore, by all these characteristics the righteous show that they are united with God, spiritually reborn. The opposite happens with the sinners, who will stand at Christ’s left. They are not condemned simply for the omission of a few small acts of love and charity, but for the opposite reasons for which the righteous were praised. First, he calls the sinners children, “as being impudent and undisciplined and going down the precipices of sin”. Just as goats go up to high places, the same is observed in sinners. The unrepentant sinners have not acquired the prudence of Christ, they have not become sheep that are led by the true shepherd, but they preferred the disordered and impudent life, they have not made themselves like the lamb of God, which means that they did not possess the character of sacrifice for their brothers. Secondly, they did not show charity and love, which means that they had not been reborn of the Holy Spirit. At the same time they showed hate. Just as love is the fullness of all the virtues, so also hate and deeds of hate, the unsympathetic manner, and the uncommunicated opinion is “the fullness of sin”. The sinners are judged by their misanthropy, because all evils follow from this. Analyzing this point, St. Gregory Palamas says that the righteous enjoy eternal life: “They have life and they have it abundantly”. “Life” refers to coexistence with God, and “abundantly” means that they are sons and inheritors of the Kingdom of God, that is to say they share the same glory and kingdom. Sinners have no share of God. At the same time they will coexist with the demons and will be consigned to hell fire. Through his creation by God, man is in His image and likeness, and through his coming into the Church, which is the Body of Christ, he is closely connected with God. Likewise through the sacraments he becomes a member of the Body of Christ. So when he does not live in accordance with God’s commandments, it is as if he was letting Christ be hungry and thirsty. Analyzing this idea, St. Symeon says that Christ was hungry for man’s conversion and repentance and man did not satisfy His hunger. He thirsted for man’s salvation, and man did not give Him a chance to taste it. He was bare of virtuous deeds, and man did not clothe Him with them, for when the Christian as a member of Christ lacks these virtues, He is as if left naked with His limbs exposed. He was shut into the narrow, filthy, dark prison of man’s heart, and man did not wish to visit Him or bring Him out into the light. The Christian knew that it was because of his indolence and inactivity that Christ was ill, and he did not help Him by good works and acts. It is impressive when he says that he was in the narrow, dark and filthy prison of the heart. Actually through holy Baptism the grace of God remains in the depth of the heart of man. But divine grace is hidden by the sins which we commit after our entry into the Church. Thus Christ is as if imprisoned in the heart. Man’s Hell will be precisely this. Connected with this is St. Gregory Palamas’ interpretation of Christ’s Parable of the Ten Virgins. According to the parable, the five wise virgins who had oil with them along with their lamps, went in to the wedding, while the five foolish virgins, who had no oil, were not found worthy of this great joy (Matt. 25:1-13Open in Logos Bible Software (if available)). Judging from our analysis of patristic passages referring to the future tribunal, it seems that the coming judgement is not a typical legal process but is Christ’s expression and revelation of man’s inner spiritual condition. He who is reborn of the Holy Spirit will then appear clearly to all men; his kinship with Christ, who will shine radiantly, will be revealed. And he who is not reborn, and especially he who has a dark and unenlightened nous, will be revealed to all men, because he will have no share in God. Just as the appearing of the sun throws light on all things, so also the coming of the true Sun of Righteousness will be a real revelation of the inner dispositions and desires of men. We shall see this put more expressively, especially in the teaching of St. Symeon the New Theologian. He adds that Christ, who is the unapproachable sun, will shine in the midst of the saints, and then all will be illuminated according to their faith, practice, hope, love, purity and illumination, which comes from His Spirit. The different mansions which will exist in Paradise will be reckoned as “the measures of their love and their vision of Thee”. Therefore according to his spiritual purity a man will radiate the brightness of God. The coming of the Sun of Righteousness among men will reveal everything. This is also how the Apostle Paul’s saying is understood: “…your life is hidden with Christ in God. When Christ who is our life appears, then you will also appear with Him in glory” (Col. 3:3-4). Another saying of the Apostle Paul is parallel: “Anything shown up by the light will be illuminated; and anything illuminated is itself a light” (Eph. 5:13). All who have accomplished divine things in their lives will be in the light, and those who have done depraved things, as St. Symeon the New Theologian teaches, “will be in the darkness of punishments” and there will be a great gulf between them. Thus at His appearance Christ will reveal men’s way of life, their whole being, what is at the depth of their heart. This revelation is eternal life and eternal hell, because the first is participation in God, and the second is connected with non-participation and non-communion with God. Therefore what will be in the next life is experienced already now. So St. Symeon the New Theologian asks God to give him His grace already now, as a pledge, that he may enjoy it in the coming life: “Grant me henceforth to serve Thee, my Savior, and to receive Thy Divine Spirit, pledge of Thy kingdom and hence to enjoy Thy banquet, Thy glory, that I may see Thee, O my God, unto the ages of ages”. Thus the appearance of God as sun will reveal the spiritual nakedness of a man. Now we have the possibility of concealing our spiritual nakedness by various means, but then all will be revealed. In one of his Catechetical Discourses St. Symeon the New Theologian presents the truth that it is not a matter of a man’s profiting from all the material, sensory and mental gifts which he happens to have in his life. There are many things in this life which conceal the blindness of our hearts and the nakedness of our souls. Many times this happens through the wisdom and knowledge of the world. We think that we are something, while essentially we are dead to God, we have nothing good. Then all will be revealed. St. Symeon the New Theologian asks: “Where will be the pretended prudence of those who are honored for their knowledge and wisdom of the world? Where our presumption and illusion that we are something, though we are nothing?” This is precisely why great fear and trembling will then seize those who are slack, careless and slothful. So, blessed is the man who lives in repentance and sees himself “lower than every creature”, because “then he will stand at His right hand in glorious apparel”. Only those adorned with the grace of God will stand at the right hand of the throne of God. When St. Symeon speaks of clothes and nakedness, he does not mean only the existence or lack of virtues, but the Holy Spirit, the very light of God. Then the night will become as light as the day; every house and cave, even heaven and earth will be removed, and thus all who have not put on Christ, that is to say “those who have not received the light… and previously been in it and become light”, then will appear naked and will be filled with much shame. Every act, bad or good, every thought, every memory that has arisen in us from our very birth till our last breath will appear. All will be revealed before men. It is impressive here that those who appear naked will be chiefly those who have not seen the light in this life and have not become light. In that case the problem is not moral, but spiritual, ontological. The nakedness is related to not having participated in the light in this life. Therefore St. Symeon recommends that they enter the narrow gate through penitence “and see the light that is within it” already in this life. The vision of the uncreated light is not a luxury of the spiritual life, but the essence and purpose of it. In the teaching of St. Symeon the New Theologian something else appears as well which is connected with what has been said. When we keep the commandments of God, we are brought to the light. Therefore not to keep the commandments takes us away from the light and commits us to darkness. So in reality the commandments of God will condemn man. The word of God is living and abides for ever. The neglected word of God “will stand in the presence of each one of us then and condemn whoever has not observed it”. The Judgement will be by the commandments of God, which will test the faithful and unfaithful. In reality the unfaithful will be self-condemning for the deeds which they have done. Then a man will not get help from human wisdom and knowledge nor from eloquence of words nor from money and earthly possessions. “Assuredly I say to you, that in the regeneration, when the Son of Man sits on the throne of His glory, you who have followed Me will also sit on twelve thrones, judging the twelve tribes of Israel” (Matt. 19:28). The Apostle Paul maintains the same thing. Reproaching the Christians for turning to worldly tribunals to solve their various affairs, he says: “Do you not know that the saints will judge the world?” (1 Cor. 6:2). But how is this judgement known by the saints? St. Symeon answers this point as well. He says that every man, finding himself faced with eternal life and that unutterable light, will see “one who is like him and will be judged by him”. All men who have lived on earth in different ways of life will be judged by other men who have lived with them in the same conditions of life. And the ones lived in accord with the will of God, the others rejected His commandments. This means that there can be no excuse that the conditions of life were difficult and that therefore they could not live according to God’s ordinances. It is terrible at that hour for someone to see in the glory of God “him who received the tonsure with him standing on the right hand, the one who ate and drank with him, his contemporary, his colleague” being completely surrounded by great glory like Christ, while he himself is the opposite. Then he will be unable to speak at all. Another point which we see in the teaching of St. Symeon the New Theologian is that in the future Judgement those who have not received the Holy Spirit will be deprived of eternal life. Not only those who have sinned will be deprived of Paradise. Someone may not have sinned but if he has no virtues, which are the fruit of the Holy Spirit, he will be deprived of eternal life, he will be expelled from Paradise and will go to Hell. What St. Symeon said is characteristic: “Even if he has no sin but if he is without virtues, he stands naked.” So even if we have not committed sins, we shall prove unworthy of the glory of God if we have no virtues. He goes on still further to emphasize that virtues are not enough, but the glory of God, the grace of God is also needed. This means that the virtues are not simply achievements of man’s individual effort, but fruits of the Holy Spirit. Just as Adam, because he did not keep the commandments of God, was stripped of divine glory and deprived of Paradise, so also he who will be found “truly stripped of divine glory” will be deprived of the paradise of the kingdom of God and the heavenly bridal chamber. What one needs in order to enter the Kingdom of God at the Second Coming of Christ is the participation of the Holy Spirit. 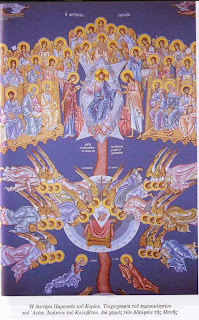 The Judgement Day is terrible because, apart from other things, one will learn “that those who do not have the Holy Spirit shining like a torch in their spirit and dwelling inexpressibly in their heart are committed to eternal darkness”. Therefore Christ exhorts us always to be ready. Just as happened with Noah’s flood, where men were “eating, drinking, marrying and giving in marriage” until Noah entered the ark and then all understood that the flood had come, the same will happen at the appearing of the Son of Man. So Christ says: “Watch, therefore, for you do not know at what hour your Lord is coming” (Matt. 24:37-42). And at the end of the Parable of the Ten Virgins Christ said: “Watch therefore, for you know neither the day nor the hour in which the Son of Man is coming”. Source: From the book Life After Death, Ch. 6: "The Coming Judgement".